The upcoming year will be a telling year for several of Alaska’s prospective development projects, starting with the biggest: the $40 billion-plus Alaska LNG Project. That’s not to say the state-owned Alaska Gasline Development Corp. did not produce any accomplishments in 2017. After taking control of the LNG export effort to start the year, AGDC promptly submitted its environmental impact statement application — nearly 60,000 pages of scientific and socioeconomic information — in April. Agency officials believe it to be the largest single EIS filing in the history of the National Environmental Policy Act review process. AGDC leaders have stressed their desire for Federal Energy Regulatory Commission, or FERC, to have a final EIS published by the end of the year, with a record of decision following shortly thereafter. Getting the EIS done in the next year would go a long way towards keeping AGDC on schedule for the early 2019 final investment decision that corporation President Keith Meyer says is critical to hitting the available Asian market window for LNG deliveries to start in 2024 or 2025. Meyer and his team point to the size of the filing as evidence of its thoroughness, which should help the federal regulators expedite their evaluation. AGDC officials and Gov. Bill Walker also note the Trump administration’s support of the project and several actions the administration has taken to speed federal permitting for infrastructure development. While FERC is known to process permit applications quicker than most other regulatory agencies, the EIS schedule that AGDC had requested be published by Dec. 15 at the latest still isn’t public; FERC continues asking the corporation for additional information, or follow-up questions, on its application. As a result, it’s still anyone’s guess as to when the first draft EIS, which comes with a 45-day public review and comment period, will be published. Similar timing questions remain on the commercial side of the Alaska LNG Project as well. The highly publicized, touted and critiqued joint development agreement Meyer and Walker signed with three giant Chinese corporations interested in partnering on Alaska LNG Nov. 9 in Beijing calls for the sides to have a framework agreement in place by the end of May 2018. The concept is that AGDC would essentially trade 75 percent of the project’s capacity, up to 20 million tons of LNG per year, to Sinopec in exchange for 75 percent of the project’s financing from the Bank of China and the China Investment Corp.
That outline would then be turned into a firm contract in the second half of the year. The nonbinding joint development agreement expires Dec. 31, 2018. Sinopec is one of the world’s largest oil and gas companies. It, and the financial firms are nationalized companies owned by the Chinese government. The status of other nonbinding Alaska LNG memorandums of understanding signed in 2017 with Korea Gas Corp., Tokyo Gas Corp. and PetroVietnam Gas Corp. is less clear because AGDC, citing commercial sensitivity, has kept their contents confidential. The Alaska LNG Project will also undoubtedly play a leading role in the 2018 gubernatorial election. Walker will highlight the state’s stewardship of the project — the regulatory achievements and customer interest. To that end, AGDC has not asked for any new state money in fiscal year 2019. The governor’s 2020 state budget proposal will be out on Dec. 15 of next year. North Slope production is expected to keep climbing in 2018, with state officials estimating an average of 533,000 barrels per day for the fiscal year that runs through June 30. Additionally, the status of the two biggest oil projects on the North Slope should become clearer in the coming year. Armstrong Energy’s 1.2 billion-plus barrels Nanushuk prospect will be handed over to Australian-based Oil Search, as part of an up to $850 million buyout announced last fall. The companies’ leaders said in an interview following the announcement that the deal is a way to continue expeditious development of Nanushuk, estimated to be upwards of $5 billion, which is too large for the exploration-focused Armstrong to manage. The Army Corps of Engineers released its draft EIS for the project in September and a final evaluation is forthcoming. First oil from Nanushuk is expected in the early 2020s. Similarly, a final EIS is the next big step for the long-discussed Liberty offshore oil project. Designed as a manmade island development in the near shore federal waters of the Beaufort Sea, Hilcorp Energy estimates Liberty could produce up to 70,000 barrels of oil per day, following in the path of other successful North Slope artificial island projects currently in production. Nearby and onshore, Hilcorp is continuing to build out Milne Point, one of the fields it bought into as part of a $1.25 billion deal with BP in 2014. The company recently drilled 10 wells at Milne Point that are just starting to come online, according to Hilcorp Alaska leaders, and plans to start drilling another 50 to 70 wells next fall and try a polymer flood project to ultimately produce between 30 million and 50 million barrels of oil from Milne Point. In Cook Inlet, Hilcorp is also in the midst of spending $75 million to convert a cross-Inlet natural gas pipeline to an oil carrier, a project it plans to finish in about a year, company officials have said. With other requisite work to adjust gas and oil flow on the west side of the Inlet, the project will allow Hilcorp to close the Drift River oil tank farm, which has been a lingering environmental concern to many because of its location at the base of Mt. Redoubt, an active volcano that most recently erupted in 2009 and caused flooding at the facility. The oil transport line will also reduce oil tanker traffic in the Inlet. While each of Pebble Limited Partnership’s activities will continue to dominate headlines, the fate of another massive mine proposal to the north should be known a lot sooner. A final EIS for the Donlin Gold megaproject in the upper Kuskokwim River valley is expected early in 2018. As planned by the company, Donlin would produce about 1.1 million ounces of gold per year over a 27-year mine life for a total of about 33 million ounces of the precious metal. Regardless of Donlin’s fortunes in permitting, Donlin Gold leaders acknowledge the project is more sensitive to gold prices than even other Alaska prospects simply because of its associated infrastructure costs. Company officials have said the project would not be economic at gold prices of about $1,100 per ounce. Gold currently sells for about $1,280 per ounce in spot trading. On Pebble, 2018 is likely to be largely a wait-and-see year. 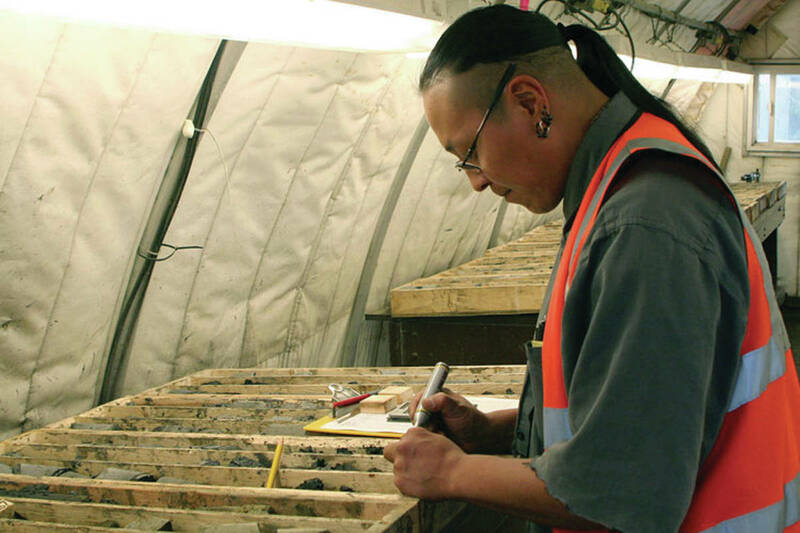 Folks on all sides of the mine debate will see if Pebble’s owner, Northern Dynasty Minerals, can finalize the framework investment deal it announced with fellow Canadian mining firm First Quantum Minerals. First Quantum said in a release it is doing its due diligence to review the project and its potential investments — $150 million to support permitting or $1.35 billion for 50 percent of Pebble — while Northern Dynasty admits it can’t develop the project itself. On the permitting side, Pebble’s Dec. 22 wetlands fill permit application with the Corps of Engineers, which will trigger an EIS, kicked off what is sure to be a three to five-year, or more, review. Pebble CEO Tom Collier said in an interview that the company believes its thorough background study work means the EIS can be done in three years, but Corps officials note the average EIS time for a project the size of Pebble is four to five years. Pebble would undoubtedly like to get the EIS done before the next presidential election in the event a new administration might try to put more restrictions on development. As for revoking its prior proposed Clean Water Act Section 404(c) prohibition on Pebble, the Environmental Protection Agency is reviewing the mountains of comments it received on the policy change, spurred by its court settlement with the Pebble Partnership. The EPA’s tally is not yet known, but Pebble opponents claim more than 750,000 comments were submitted in support of stopping the project. What the EPA will do with the proposed reversal of its original proposal is also unknown. The agency could make a political statement and finalize its move to revoke the Obama administration’s proposed mine veto or, since no substantive action was taken against Pebble, simply leave it in limbo and let the permitting process play out. The Stand for Salmon citizen-driven ballot initiative to significantly tighten the state’s salmon habitat permitting laws is sure to be 2018’s version of Alaska’s omnipresent development versus conservation debate. That is, if the state Supreme Court allows it to be. The state Department of Law, at the behest of Lt. Gov. Byron Mallott, appealed an October Superior Court ruling to uphold the initiative and that appeal is currently before the Supreme Court. There is no indication as to when the court may or may not hear and rule on the case. Mallott originally rejected the proposed initiative based on Law’s opinion that it would direct state water resources to fish habitat, taking that resource allocation authority away from the Legislature and thus violate the state constitution. The petitioners are currently hustling to gather the roughly 32,000 signatures they need from voters by mid-January to get it on the 2018 ballot while everyone waits to hear from the Supreme Court. If the initiative is upheld in court, it is likely to galvanize Alaska’s development proponent groups, which have already formed their own counter-measure campaign, Stand for Alaska, to raise money to fight the initiative. Opponents contend the proposal, aimed to give the Department of Fish and Game more authority in permitting large projects, would make even many small developments unworkable and cost-prohibitive. Stand for Salmon leaders counter that they are just pushing the reforms requested by the Board of Fish in January 2017 to update the state’s vague and decades-old salmon habitat protection statute. Gov. Bill Walker opposes the initiative, saying its scope is far too broad, and if upheld in court it will be another topic amongst gubernatorial candidates. And even if the petitioners don’t gather the signatures they need in time for the 2018 ballots, that just means it could resurface in 2020 — again, assuming the Supreme Court stays with the lower court ruling.